A thug who left his ex-girlfriend with fractured bones in her face because he wrongly believed she was with another man has been jailed for ten years. Steven Burton used "extreme" violence in the attack and left his victim with a fractured skull, multiple fractures to her facial bones, a broken wrist, facial bruising and a bite mark to her cheek. The damage to her face caused a build up of blood behind her ear, which resulted in hearing loss for the 31-year-old victim, who lives in Sunderland. The woman said the scar from the bite to her face is a "constant reminder when she looks in the mirror" of the violence she endured that night. Prosecutor Jolyon Perks told Newcastle Crown Court: "It was a completely unprovoked attack because of the fixation with the fact she had another man at the house, which was untrue." 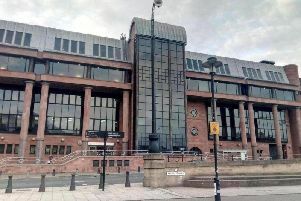 The court heard the attack happened in August last year at a house in Sunderland, where the 33-year-old attacker, who was out on licence from an earlier prison sentence, had disconnected the CCTV system before he knocked on the door. Mr Perks said: "On opening the front door to him she was subjected to an immediate assault. "When she arrived at hospital she gave a description of the assault to medical staff, which included being stamped on and punched to the head and face." The court heard Burton was aware the woman suffered from a long term illness which gave her brittle bones. Burton, of no fixed address, admitted causing grievous bodily harm with intent on the basis the woman was not his intended victim but he had planned to fight any man who was there. At the time Burton was out on licence from a prison sentence imposed when he attacked a different ex-partner while she was driving, which caused her to crash into another car. When the driver of the other vehicle tried to help, Burton punched him unconscious and fractured his skull. In 2016 Burton had been given a suspended sentence for an attack on another ex-partner. Judge Simon Batiste sentenced Burton to ten years behind bars with an extended four year licence period and a lifelong restraining order to keep him away from the latest victim. The judge told him: "You, for some reason, got it into your head your ex-girlfriend might had a new man at the house. "It is clear you are an extremely jealous man. "You, on your own plea, accept you went to the property in order to fight, I say attack, a man in the property." Judge Batiste told Burton: "I have come to the conclusion there is, in this case, a significant risk of serious harm from you by by the commission of further offences of violence. "Extreme violence was used, causing serious injury, without provocation and with some premeditation. "I am satisfied it is necessary to protect the public, particularly partners, but also the general public who you may come across." Richard Holland, defending, said Burton is remorseful for what he did and added: "He realises he can't keep on going like this. "He has some issues that plainly need treatment and rehabilitation." The police officer investigating the case hopes it gives the confidence for other victims to come forward. Detective Constable Sara Stewart, of Northumbria Police's Safeguarding Department, said: "This woman has suffered horrific injuries at the hands of Burton and no one should ever be subject to such violent abuse. "Burton is a dangerous man and the level of injury he has inflicted on the victim clearly shows his true nature. "The victim absolutely did the right thing by calling the police that night. This has given us the opportunity to get Burton off the streets to prevent him attacking the victim again or assaulting anyone else. "I hope it gives others who may be suffering violence or abuse to come forward. Making that call today could save your life." The victim said in an impact statement: "When Steven assaulted me it was a totally unprovoked attack. "I opened the front door to Steven and he immediately began hitting me. As a result of this I sustained various injuries including a broken left arm which required surgery to pin it back together. I am devastated by what he did to me. I do not want him to be allowed anywhere near me or my home again. " Anyone who is a victim of abuse is asked to contact police on 101 or 999 in an emergency. Victims can also contact Victims First Northumbria on 0800 011 3116. For more information about domestic abuse and violence advice search Northumbria Police online. All our webpages have a 'hide page' function and there is guidance on deleting your internet history. If you have concerns about using your own devices, contact a close friend or family member to use their device or use the internet access at a local library.